Welcome to my PayPal Money Adder / Generator Review 2019! Have you seen people on the internet claiming that they get free money into their PayPal account using those tools and you think whether it is real or scam? No matter what these tools claim, I must congratulate you for taking your time to do your own research before using them. The best way to uncover the truth about any product is to see the reliable reviews on the web. Let me be clear with you; I'm not associated with any such tools. Instead, I'm here to reveal the truth behind such tools and what they can really provide for you. 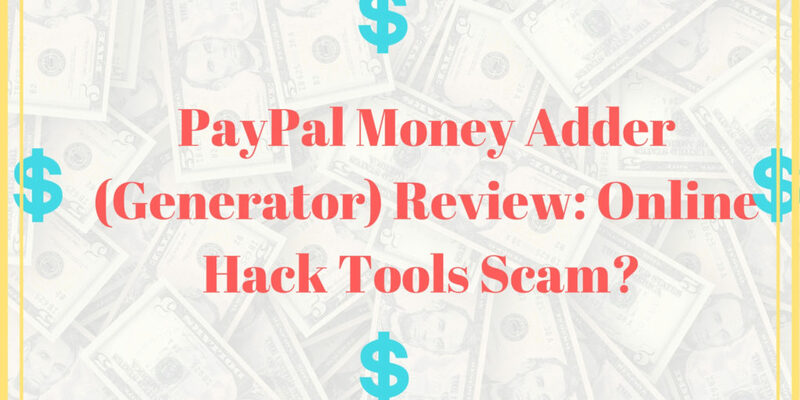 Summary: PayPal Money Adder (Generator) is tools created by many developers whose sole purpose is to hack other members PayPal account and withdraw money from them. What is PayPal Money Adder (Generator)? Even they claim that you can get up to $10,000 in no time just by putting in your name and PayPal id. Remember there is not only one adder out there, but if you search on the web, there are numerous such sites that are offering this with different claims and working styles. Even they have created fake videos to build trust in the people eyes that such software is working for them. Even when you read at those videos comments, you can find many people are praising their software. Creating videos like these aren’t difficult at all nowadays, and you can buy likes, dislikes, and comments on sites like Fiverr or SEO Clerks. Do you think that PayPal which is the biggest online bank can afford to give such money for free? They have all the times full of top security experts from all over the world with strict regulations from statutory bodies. So, these are all scams, and I will let you know within a few seconds about what benefits such developers will get for creating software like this. How PayPal Money Adder (Generator) Really Works? There is absolutely no information available on how the tools and bring in free PayPal money. They only require you to give your email id, password and complete one or two surveys. Some tools are web-based while others are software that you need to download. Whether you use web-based or downloaded software, they are all equally malicious. Most of the times they are emphasizing too much on a web-based tool. The reason is that it is free of any malicious codes that you could suffer in case of software which is required to be downloaded. But here is the trap; they will ask you to buy this web-based tool, or their tool requires you to enter PayPal id and password. Tired of Scam, Click here to see my #1 recommend program! You may be thinking if they don’t work so why they are created. Dear, nothing comes free in this world, especially money. The people who are creating such tools are a group of hackers, and their sole purpose is to get your PayPal information and exhaust your account. They are trying to make this group into a big industry. This isn’t something new; if you look at one other similar industry High Yield Investment Programs (HYIP), they are also looting people for over a decade now. There are two ways they can take your money. The first one is, they sell that software for good price. Many lazy people are very keen to find such stuff online where they don’t have to work. At last, they realize that they get trapped in a scam. Because, if they buy it and the software doesn’t work (obviously it will not), there isn’t any refund available. The second way is they ask you to complete a survey, which usually requires you to involve in a lengthy process and this will make such people to earn $5 to $10 for each survey. Even, similar to surveys, you are sometimes asked to complete offers which require credit card info for a trial period or purchase for that offer. Whether you choose the first one or a second, they will make money, nevertheless. They get your email addresses and add them in autoresponders where they all the time spam you different products and offers. Everyone knows the power of email marketing, and when you send newbies such high tickets offers, some people will trust you and buy those products. The world isn’t empty of those people. The next thing they can do is to sell your email ids to different other people. Who will do the same spam emails or phishing emails to steal your information? That’s true. You could search many people have lost their PayPal money due to such scams. So, such money adders require you to enter your PayPal id and password to login to your PayPal account, and they get the same info as well. After that, you could find your PayPal account empty. Never provide such info to anyone. Not only this, but they will also clean hands on bank accounts linked with your PayPal account. Some of the platforms provide you a software which you need to download and run it on your PC. The risk of using that software is that they contain malicious codes which can steal information from your PC and send to the developers. You can imagine how much risk you are taking after using it. So never download anything unless it’s from a trusted source. These are the top four issues such tools exist in the market, and people are using them and getting themselves trapped in the hands of such people. The above reasons are pointed out to make sure you have a well understanding of what could happen if you’re on any of this PayPal Money Adder software. Is PayPal Money Adders (Generators) a Scam? PayPal Money Adders (Generators) is a scam, and their sole purpose is to hack others people account and get money from those accounts. How could you think that the biggest bank on the internet could allow you to do all this? They have a security department which has a high professional from all over the world, and they don’t allow this to happen. Even if you don’t see any of the above issues after using such tools, don’t forget there is a risk of banning your PayPal account. So, my recommendation is to avoid such tools at all cost and don’t risk yourself in the hand of perpetrators. Want to Earn a Full-time Income From Home? Though PayPal Money Adders (Generators) is a scam, I recommend you to put your focus on your own online business. Many platforms guide you this entire in a step-by-step manner. There is no shortcut here, but if you put consistent effort there, you can build your online business pretty quickly. Affiliate marketing is one such business type that I recommend to make money online. Don’t put so much effort on such tools and other similar fake sites. If you believe in hard work and looking for a trusted platform that will provide you with everything to take a start, I recommend seeing the best site, i.e., a Wealthy Affiliate. Using this site, I have earned four figures income per month, and now my next goal is to earn a five-figure mark. Join Wealthy Affiliate for Free Here! What's your thoughts on my PayPal Money Adder (Generator) review 2019 and if there is any question in your mind, please ask me in the comment section. What is Price Optimization and How Does it Work? How to Detect Spun Content for Free? AdReel Review – Discount, Bonuses and Features! Aliexpress Affiliate Plugin Review – Best for E-commerce Sites!